We are looking forward to welcoming our new Year 7 (Purple Ties) who will be joining us in September 2019. There is more information about what will happen before you join us in September if you scroll down this page. Here are key dates for those joining the college in Year 7 in September 2019. Wandsworth Council recommend you complete your form and submit it by Friday 19th October before the half term break. You should submit your application for secondary school places to your home borough (ie the borough where you live). 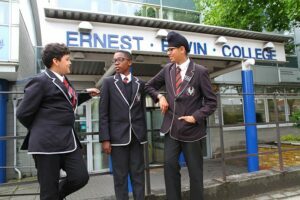 You will receive your offer of a place at Ernest Bevin College in March. Wandsworth Council will post offers on 1st March 2019. Online applicants will be sent a notification email from 5pm on 1st March. You must reply to your home borough accepting the place you have been offered by 15th March. You can choose to stay on the waiting list for schools of higher preference. It is advisable to accept the offer you have received to ensure you have a place, this can be declined if you are offered a place at another school you have been on the waiting list for. A second round of offers will be made and places may continue to come available into the summer term as the waiting lists move. School tours for those who haven’t visited the school before ahead of the deadline to accept offers. Please book a place in advance and arrive at 9am. Boys must be accompanied by a parent/guardian. Each boy who has accepted a place at EBC is invited to come into the college with their parents or guardians to meet a member of staff. The meeting is a chance to fill in the necessary paperwork, order school uniform and ask any questions you may have – it is not an ‘academic’ or selective interview. Although these Open Mornings are primarily aimed at pupils looking to make the transition next year, you are very welcome to come and see the college on a normal working day. There will be a chance to tour the college, see lessons taking place and the facilities. There will also be the chance to ask questions to the Principal and members of the Senior Leadership team who will be based in the library. All Year 6 boys are invited into college with their parents. There will be a short presentation by the Head of Year and then the year group will break up into tutor groups and boys will have the chance to meet your tutor and other students who will be in your tutor group. Only Year 7 students come into college on this first day of term. The Year 7 team will run an induction programme to help the boys get to know other members of their tutor group and to find their way around school. We also run Year 7 & 8 buddy afternoons during the first half term to help new students get to know boys in other tutor groups and those in the year above them. There is more information about Year 7 Induction Day by clicking the link. If you have any questions about Year 6/7 transition please contact the college on Tel: 020 8672 8582.